alaTest has collected and analyzed 25 reviews of RCA EZ1100. The average rating for this product is 2.7/5, compared to an average rating of 4.0/5 for other Camcorders for all reviews. Reviewers really like the size and image quality. The battery and portability are also appreciated. Some have doubts about the durability. Views are divided on the design. We analyzed user and expert ratings, product age and more factors. Compared to other Camcorders the RCA EZ1100 is awarded an overall alaScore™ of 75/100 = Good quality. 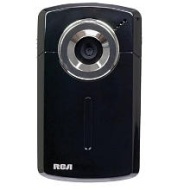 alaTest has collected and analyzed 23 user reviews of RCA EZ1100 from Amazon.com. The average user rating for this product is 2.8/5, compared to an average user rating of 3.9/5 for other Camcorders on Amazon.com. People really like the size and image quality. The battery and portability also get good feedback. Many are less positive about the durability. Views are divided on the design. 48% of the reviews on Amazon.com give this product a positive rating. One camera did fine, the other one didn't download software to use it on computer.I emailed the company but got no answer..So,I would think twice befoere ordering from RCA again.